Swiss designer Rinspeed has come up with a good looking concept car that's packed with technology for the business user. 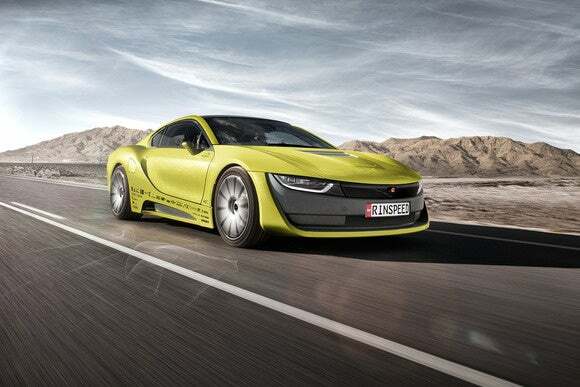 The Etos is based on a BMW i8 but has what might be described as a turbo tech package. For starters, the car is self-driving, which these days is pretty standard for a concept car. On the Etos, that enables a neat little trick. When put into autonomous mode, the steering wheel folds itself in half and recedes into the front console, freeing up space in front of the driver. 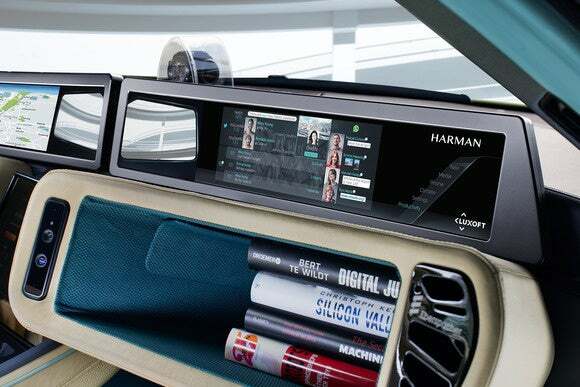 Just above the wheel and running the length of the dashboard are a couple of thin and wide 4K displays. They move towards the driver as the steering wheel disappears, making them easier to see and interact with. It's quite the sight and you can see all this in action in the video below. But that's just one aspect of the tech in this car. Harman, which created the electronic cockpit, built it around Office 365. As a driver or passenger gets in, the car recognizes their smartphone and logs into their Office 365 account, bringing access to email, messaging, file storage and Skype video calls. For the latter there's a camera on the dashboard that can face the driver or passenger. Most of the interaction with the system is accomplished through Cortana, Microsoft's digital assistant that takes voice input. In a demonstration, a driver told the car it wanted to stop for a coffee. The car responded by plotting a course to a local coffee shop. When an email arrived, the driver was able to use Cortana to set up a video call and have it entered into the calendar and when time for the video call came, the car requested to be switched into autonomous mode and even replotted the route so it would avoid areas with bad cell reception. And if that wasn't enough, the car has another surprise up its sleeve -- or rather perching on the rear above the trunk. A launching and landing pad for a drone. The concept has a DJI Inspire sitting there and the idea is that the drone can help the driver during their day. 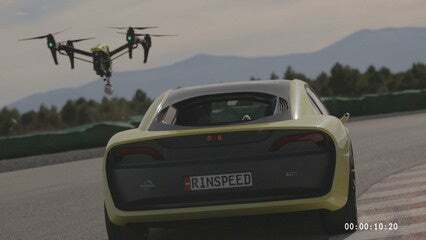 In a promotional video, Rinspeed imagines the drone flying off the back of the car to take shots of it while it races around a track, or following the driver and passenger to snap pictures as they explore the countryside. And it could even save a relationship. Another scene in the video has the car reminding the driver that it's Valentine's Day and flying off to collect some flowers. The Etos is just a concept, and it's unclear how much of the technology works beyond the demos. Rinspeed doesn't make production cars so don't look for this anytime soon, but it's a fascinating and fun look at what a car of the future might bring business users.